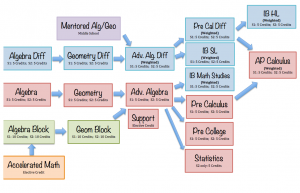 Check out the math class flowchart below to see which class you should register for. Need help? Feel free to ask any math teacher or your counselor. NOTE – 8th grade Algebra does count towards the 30 credits.